December 2 is here, and that marks the implementation of the CRTC Wireless Code, which establishes basic rights for wireless customers and forces carriers to implement a certain set of standards. Details of the code were first announced back in June and the biggest change was the elimination of the three year contract. 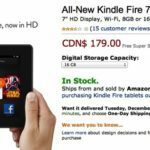 Canadian carriers were quick to implement two-year contracts to meet the Wireless Code, but it came with a cost as plans and the up-front prices for subsidized devices increased. Rogers, TELUS and Bell have been busy since then implementing changes to adhere to the code, along with regional carriers as well. Slowing smartphone growth actually has little to do with shorter contracts and is instead part of a trend sweeping the developed world. Just about every manufacturer has been reporting slowing sales, from Android heavyweights Samsung and HTC to market laggards Nokia and BlackBerry. Even Apple was forced to quickly cut the price on the iPhone 5C, while Samsung is lowering its own internal projections for 2014. Nowak points out the same message isn’t being spewed by TELUS, which recently had a reasonable wireless quarter and also fared well in the recent CCTS report, showing much lower numbers of complaints versus its rivals (Bell and Rogers had a combined 56% of complaints). Anyways, back to your wireless rights. Below are 20 Wireless Code Rights you need to know about now that it’s in effect, as shared by the CRTC. Make sure you keep this checklist handy if you are dealing with your wireless carrier. 20. You have the right to a copy of your contract in an alternative format for free and to a longer (30-day) trial period to ensure that the service and phone meet your needs. 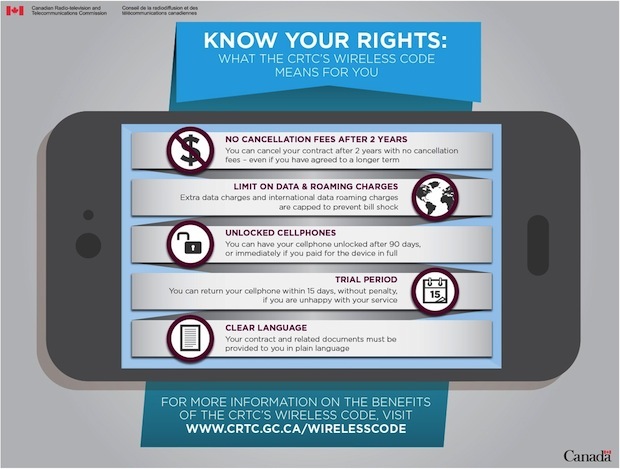 What do you think about the CRTC Wireless Code? How has it affected your wireless needs so far?